Gallery Rally! Saturday April 6th! 10 Dearborn Galleries! Dearborn Gallery Rally! Saturday April 6, 2019! 10 Galleries! Featuring student artwork from Geer Park Elementary, Maples Elementary, STEM Middle School, Edsel Ford High School and Magnet High School at ArtSpace. Dearborn Art Teacher artwork at Rotunda Gallery inside Henry Ford Centennial Library. 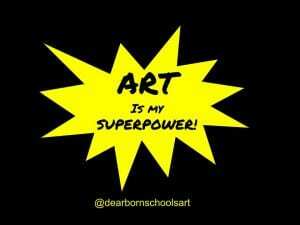 Dearborn Art Teachers Rotunda Gallery art show & Gallery Rally info! Mark your calendars! Art Show opens April 24th at 4:00 pm! Mardi Gras banners by Middle School students and teachers! Professional Development at the Arab American National Museum! Great educator morning at the Detroit Institute of Arts! Printing with Michigan Youth Arts grant supplies! SURA program with AANM open for registration! Artist Talk Back in a Snowstorm!